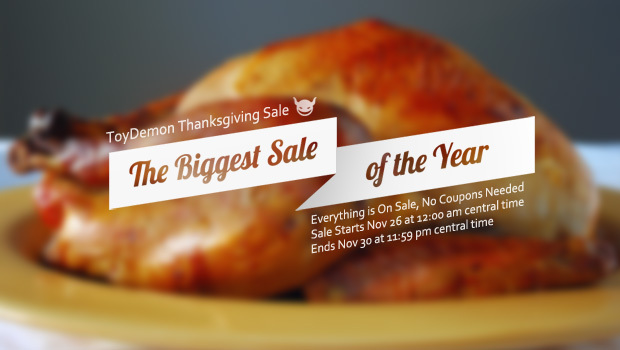 ToyDemon 2015 Thanksgiving Black Friday Sale is Here......Early! As many of you have been waiting and expecting, Thanksgiving is here and of course ToyDemon's Black Friday is also almost here. We will let you in on a little secret, the Black Friday this year will start a little earlier. The sale will officially start on Thursday 11/26/2015 12:00am CT and last through Monday 11/30/2015 11:59PM CT. The price has been slashed on basically every item and prices you love from ToyDemon.com. In addition, this year we are doing a Door Buster Flash Deals each day with limited quantity. You will see some of the hottest items on ToyDemon at its lowest price ever! Don't just take our word for it and check it out for yourself come Thursday. There's more! Each day you will see different items added to the Door Buster Deals so you definitely have to check back and grab them while they are still available. And..............we are still not done yet! We are giving you an additional 5% off when you add up to 5 items or more into your cart. That's right, additional 5% off the already super low prices, no coupon code necessary so you can use the "FREESHIP" coupon code for free shipping. Do not miss out on this year's Black Friday and stack your savings with our Door Buster Flash Deals, loyalty member discount and rewards, 5+ items for another 5% off, and "FREESHIP" for free shipping on your order over $50. If you are still not buying, then we don't know if you ever will! At last, everyone here at ToyDemon wishes you a Happy and Safe Thanksgiving. time to get out your wallet!